Stepping Stones is the latest addition to the Otley Brass Band Family. Established in 2013, it is a fast growing band intended to improve the standard and enjoyment of brass players who are just starting out. Stepping Stones is under the Musical Directorship of Andy Novell. Andy is a teacher of brass in many of the local schools as well as being MD of Wharfe Brass. He is also a brass player himself playing for York Railway Institute Brass Band. Stepping Stones play in several informal concerts a year. They are often included in the concerts given by Otley Brass Band and Wharfe Brass. Please see the Events Calendar for more details. 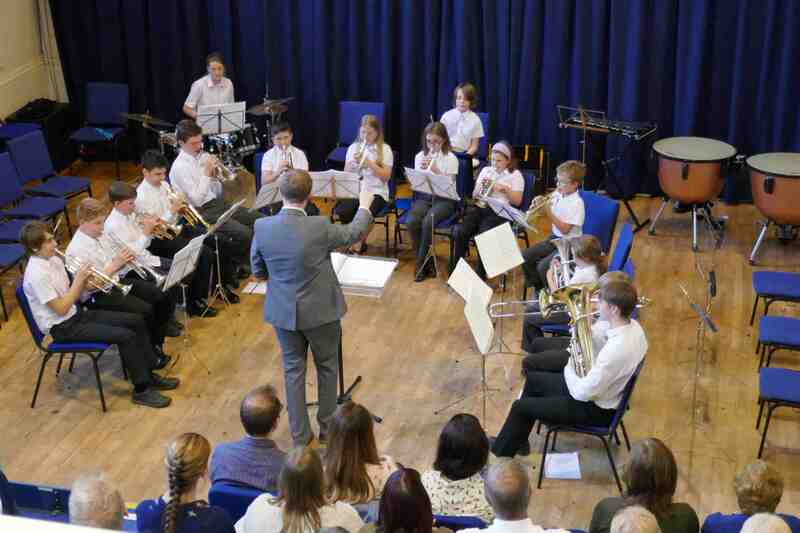 By playing in a starter brass band, young musicians will quickly acquire and develop musical and performance skills that will not only improve their individual independent playing, but will help them move into bigger ensembles. Stepping Stones caters for young players from approximately Grade 1 standard upwards. Rehearsals are every Tuesday at 5.30 until 6.15, during term time, at The Courthouse in Otley. There is a viewing gallery for parents/carers to stay and listen if they wish.